Thermo King launched the first commercial container refrigeration unit in 1956 and never looked back. With an entrepreneurial and innovative approach, Thermo King provides an industry-leading product range and a global network of trained dealers that allow consumers around the world to enjoy fresh and frozen foods, year-round. 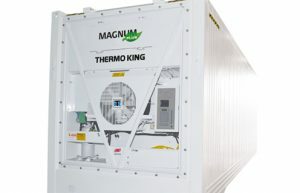 Reliable, high performance solutions define Thermo King’s entire product line, which includes refrigerated reefers that protect fresh, deep frozen and other high value cargo; a low emission, durable generator set range; innovative air management products; and advanced telematics technology for both reefers and generator sets. Our new energy data logging feature is standard on all Thermo King MAGNUM PLUS® units starting in 2018; it tells you exactly how much power your reefer is using. All the time. Thermo King’s Advanced Fresh Air Management technology takes the guesswork out of fresh air exchange, regulating the internal container environment based on the cargo’s respiration cues and pre-set parameters.